1. 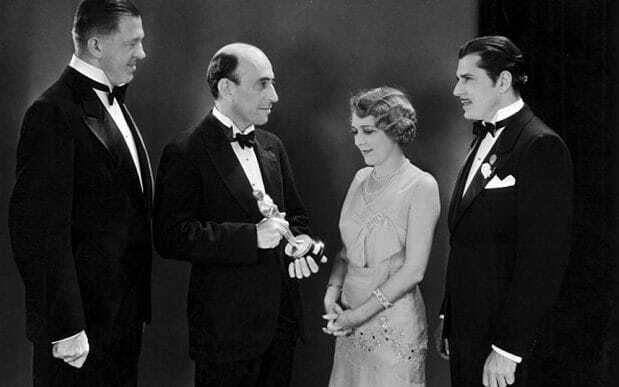 Everything started during spring of 1929, when the first Academy Awards celebrated the first version of what they didn’t know would later be a worldwide cultural phenomena. The first Academy Awards ceremony held in Hollywood did not broadcast, had around 270 guests and the name “Oscar” was not on scene for a few more years. It was May 16, 1929, the venue was the downstairs Blossom Ballroom at the Hollywood Roosevelt Hotel and the 270 guests have paid $5 for their tickets to assist to the glamorous ceremony. The 12 winners were announced 3 months prior the ceremony in Los Angeles Times, no surprises that year. The Winners for Best Actor and Best Actress were Emil Jannings and Janet Gaynor. DiCaprio’s best actor win for his starring turn in “The Revenant” at the 88th Academy Awards — his first Oscar — generated more than 440,000 tweets per minute. That made it the most-tweeted minute of an Oscars telecast ever, handily beating the previous record of 255,000 tweets per minute, set in 2014 when host Ellen DeGeneres tweeted a star-studded selfie. After DiCaprio’s win, the next most-tweeted Oscars moments were the “Spotlight” surprise win for best picture followed by “Mad Max: Fury Road” picking up its sixth statue of the night, for sound mixing.Twitter said there were 24.2 million total Oscar-related tweets from 5:30 p.m. to 1 a.m. ET, yielding 3.9 billion overall impressions; last year, Twitter said 3.7 billion tweet impressions were viewed in a 48-hour period. That indicates higher activity on Twitter for the Oscars this year, after Super Bowl chatter was down year over year and the social service posted a decline in monthly active users in the fourth quarter of 2015. Won all 11 categories for which it was nominated: Best Picture, Director, Adapted Screenplay, Original Score, Original Song, Sound Mixing, Art Direction, Makeup, Costume Design, Film Editing, and Visual Effects. The 1974 Oscars breakout star was a ten-year-old Tatum O’Neal, who starred in Paper Moonalongside her father Ryan—and managed to win the Best Supporting Actress prize for her turn as the sidekick of the con-man Bible salesman in the Depression-era story. Forty years later (and counting), she remains the youngest actor to ever win an Academy Award. She still acts in movies and television, but hasn’t made it back to the Oscars spotlight. Henry Fonda is the oldest Oscar winner (at 76 years old), was nominated for the movie On Golden Pond (1981), he died at age of 77, one year after winning the Academy Award. Although “Birdman” won 4 Oscars at the 87th Academy Awards, Michael Keaton went home empty-handed. That is, after he put away the speech he was holding in his hand in anticipation of winning in the Best Actor category. The Best Actor award went to Eddie Redmayne, 33, for his portrayal of Stephen Hawking in “The Theory of Everything”. Other nominees in the Best Actor category included Benedict Cumberbatch, Bradley Cooper, and Steve Carell, with Keaton being the clear favorite. However, the Academy obviously thought Redmayne’s performance was more Oscar-worthy and awarded the young British actor. Michael Keaton is seen putting away his Oscar acceptance speech upon realizing Redmayne had actually won the award. In the video, the 63-year-old actor is seen looking down in disappointment as he reached for his pocket to put away the piece of paper he was holding prior to the announcement of the winner, as the entire room applauded Redmayne for his big achievement.